I looked through one of the Australian Women's Weekly cookbooks, I found this White Chocolate Macademia Nuts Cookies recipe and thought it would be great for Christmas . I substituted macademia nuts with hazelnuts and vanilla essence with orange juice. I reduced the sugar and white chocolate coz I don't like them too sweet. Hmmmmm…the cookies were fantastically yummy. 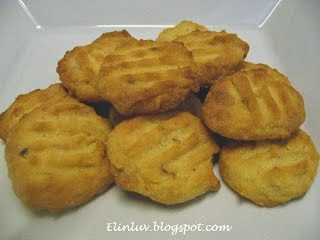 The light tangy orange scent added flavor to the cookies.. Easy to make and melts in the mouth. If you have yet to bake your Christmas cookies...you can try these. Very refreshing and delicious ! Beat together the butter and sugar until it is pale and creamy, in an electric mixer. Beat in the orange juice and egg yolk. Add the flour, white chocolate chips and chopped nuts. Mix until you have a smooth dough, with the only lumps being the chocolate and nuts. Using your hands, roll the dough into marble-sized balls and lightly press each one flat on to a greased baking sheet, making sure they are spread slightly apart.